Javier Manuel Hernandez Jr. (born February 20, 1978) is an American actor and fashion model. 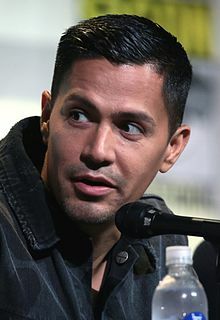 After making his television debut in NBC's Hang Time, Hernandez made his film debut opposite Kirsten Dunst in the romantic drama Crazy/Beautiful (2001). He has since starred in numerous films, including Friday Night Lights (2004), Hostel (2005), Bad Moms (2016), and as Chato Santana / El Diablo in Suicide Squad (2016). In February 2018, he was cast as the new Magnum in the CBS reboot of Magnum P.I. filmed in Hawaii. Javier Manuel Hernandez was born on February 20, 1978, in Montebello, California, the son of Isis (née Maldonado), a secretary and accountant, and Javier Hernandez Sr., a mechanic, both of whom are third-generation Mexican Americans. He has a younger sister, Amelia, and two older brothers, Michael and Gabriel. He met his wife, actress Daniella Deutscher, when he was 14 years old and Daniella was 17 at that time. He attended Don Bosco Technical Institute in Rosemead, California, but transferred to Schurr High School in Montebello his senior year. While riding an elevator in a high-rise in Los Angeles, Hernandez was approached by talent manager Howard Tyner who suggested Hernandez had what it took to have a successful career in Hollywood. He enrolled Hernandez into acting school and sent his pictures to casting agents. From 1998 to 2000 he played Antonio Lopez on the NBC series Hang Time. Hernandez subsequently hit success with his role opposite Kirsten Dunst in Crazy/Beautiful. He has since appeared in several major Hollywood films, including playing the lead roles in Carlito's Way: Rise to Power, the 2005 horror film Hostel and World Trade Center. Hernandez appeared in the action/crime film Takers, which was released in August 2010. Hernandez appeared in the 2005 crime prequel Carlito's Way: Rise to Power, playing Carlito Brigante, the role originated by Al Pacino in the original 1993 film Carlito's Way. Hernandez portrayed Paxton in Eli Roth's Hostel (2005) and its 2007 sequel, Hostel: Part II. In 2016, he starred as Jessie Harkness in the comedy film Bad Moms, and as metahuman ex-gangster El Diablo in the superhero film Suicide Squad. On February 20, 2018, news outlets reported that Hernandez was cast as Thomas Magnum in CBS drama series Magnum P.I. reboot. The series premiered on September 24, 2018. In 2006, Hernandez married his former Hang Time co-star Daniella Deutscher. ^ "The New York Times". The New York Times. Retrieved 2012-02-18. ^ Andreeva, Nellie (December 30, 2018). "'Magnum P.I. ': Jay Hernandez Cast As Thomas Magnum In CBS' Reboot Pilot". Deadline Hollywood. ^ a b c d Garcia Berumen, Frank Javier (August 1, 2014). Latino Image Makers in Hollywood: Performers, Filmmakers and Films Since the 1960s. McFarland, p. 307. Archived at Google Books. Retrieved August 13, 2016. ^ a b c d "Actor gets a tortured role in 'Hostel'", eastvalleytribune.com, 11 January 2006. ^ "Film Reference". Filmreference.com. Retrieved 2012-02-18. ^ a b Munoz, Lorenza (June 27, 2001). "Suddenly, Expectations Are Being Heaped on Him". Los Angeles Times. ^ Anita Gates (2005-10-01). "Carlito, When He Was Young". The New York Times. Retrieved 2012-02-18. ^ "Max: What Kind Of Dog Is Max?". The New York Times. June 18, 2015. ^ Otterson, Joe (20 February 2018). "'Magnum PI' Reboot Pilot at CBS Casts Jay Hernandez in Lead Role". Variety. Retrieved 20 February 2018. ^ "I Saw the Sun Rise". IMDB. Retrieved 30 September 2018. ^ Cabrera, Daniela. "Jay Hernandez & His Wife Had A Very '90s Meeting". bustle.com. ^ Friedlander, Whitney (14 July 2014). "Thomas Jane to Star in Syfy Thriller 'The Expanse'". variety.com.